There have been reports in the past month about another potential terrorist attack disrupted in New York City. Bringing these high profile terrorist leaders to New York will just put a target on New York again. Even worse, the White House is going to subject these terrorists to criminal trials in civilian courts. They will get all the due process rights of citizens in court and potentially will be able to get access to material evidence in a civilian court that could reveal intelligence we’d prefer them not to have. President Barack Obama’s decision to put the 9/11 mastermind Khalid Sheikh Mohammed on trial on American soil is risky but bold. Courtrooms and prisons could become the target of terrorist attacks, and their localities subjected to months or years of intensified security. Defendants will be entitled to the full constitutional protections enjoyed by average felons, while Mohammed will undoubtedly use the court as a platform from which to denounce the US, praise the Taliban and al-Qaeda and proclaim his desire for Islamic martyrdom ad nauseam. His lawyers will argue that any incriminating evidence gathered from a man who was water-boarded 183 times and held in a secret CIA prison for three years and then three years in Guantanamo cannot be trusted. Embarrassing details are likely to emerge of his treatment at the hands of American agents. Evidentiary requirements will also be tougher in a civilian court than the military commissions that had begun for the five alleged plotters at Guantanamo before Mr Obama ordered their suspension. Fortunately for the prosecution, Mohammed actually admitted to al-Jazeera television that he was the prime architect of the suicide attacks on the US before he was captured in Pakistan in March 2003. So it is hard to imagine him walking free. But some of the others, the bag carriers, may in the end only face charges of material support for terrorism and could receive less-than-life sentences, prompting public outrage. The most significant impliation of the announcement is that the transnational alliance of America-haters will get first-hand information on America’s counterterrorism and intelligence programs — the great hope of the terror-backing neo-communist left, at home and worldwide, is that the Obama administration will continue to build a case for torture trials for former Bush administration officials. This summer, I theorized that Attorney General Eric Holder – and his boss – had a hidden agenda in ordering a re-investigation of the CIA for six-year-old alleged interrogation excesses that had already been scrutinized by non-partisan DOJ prosecutors who had found no basis for prosecution. The continuing investigations of Bush-era counterterrorism policies (i.e., the policies that kept us safe from more domestic terror attacks), coupled with the Holder Justice Department’s obsession to disclose classified national-defense information from that period, enable Holder to give the hard Left the “reckoning” that he and Obama promised during the 2008 campaign. It would be too politically explosive for Obama/Holder to do the dirty work of charging Bush administration officials; but as new revelations from investigations and declassifications are churned out, Leftist lawyers use them to urge European and international tribunals to bring “torture” and “war crimes” indictments. Thus, administration cooperation gives Obama’s base the reckoning it demands but Obama gets to deny responsibility for any actual prosecutions. Today’s announcement that KSM and other top al-Qaeda terrorists will be transferred to Manhattan federal court for civilian trials neatly fits this hidden agenda. Nothing results in more disclosures of government intelligence than civilian trials. They are a banquet of information, not just at the discovery stage but in the trial process itself, where witnesses – intelligence sources – must expose themselves and their secrets. Let’s take stock of where we are at this point. KSM and his confederates wanted to plead guilty and have their martyrs’ execution last December, when they were being handled by military commission. As I said at the time, we could and should have accommodated them. The Obama administration could still accommodate them. After all, the president has not pulled the plug on all military commissions: Holder is going to announce at least one commission trial (for Nashiri, the Cole bomber) today. Moreover, KSM has no defense. He was under American indictment for terrorism for years before there ever was a 9/11, and he can’t help himself but brag about the atrocities he and his fellow barbarians have carried out. So: We are now going to have a trial that never had to happen for defendants who have no defense. And when defendants have no defense for their own actions, there is only one thing for their lawyers to do: put the government on trial in hopes of getting the jury (and the media) spun up over government errors, abuses and incompetence. That is what is going to happen in the trial of KSM et al. 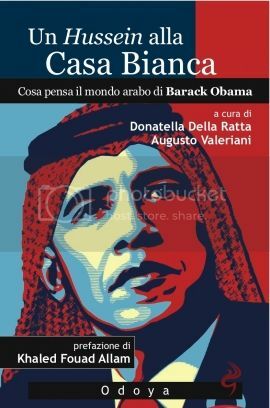 Image Credit: Donatella Della Ratta, A Hussein at the White House: What the Arab world thinks about Barack Obama.